Diana: Editors E. Charles Nelson and David J. Elliott have compiled a book about a man I’d never heard of: Mark Catesby. 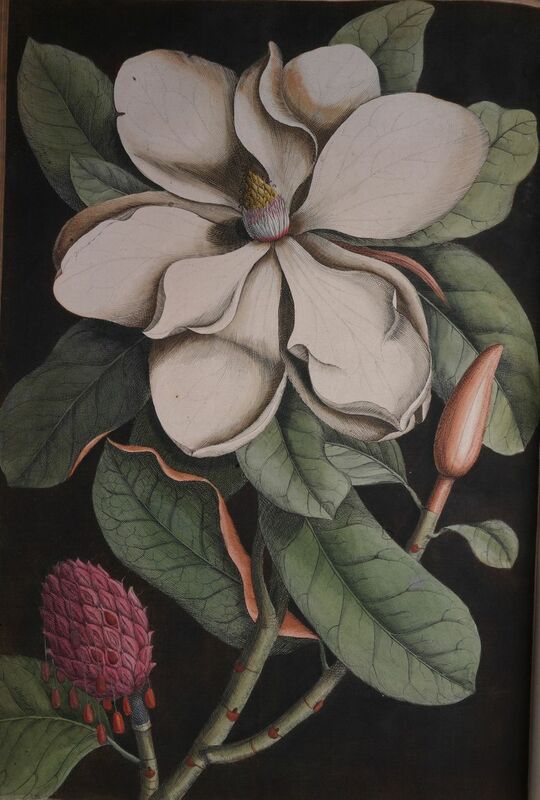 One of the earliest naturalists, as well as an author and illustrator, Catesby studied the fauna and flora of North America over a seven-year period. He influenced Audubon, Darwin, and the explorers Lewis and Clark. 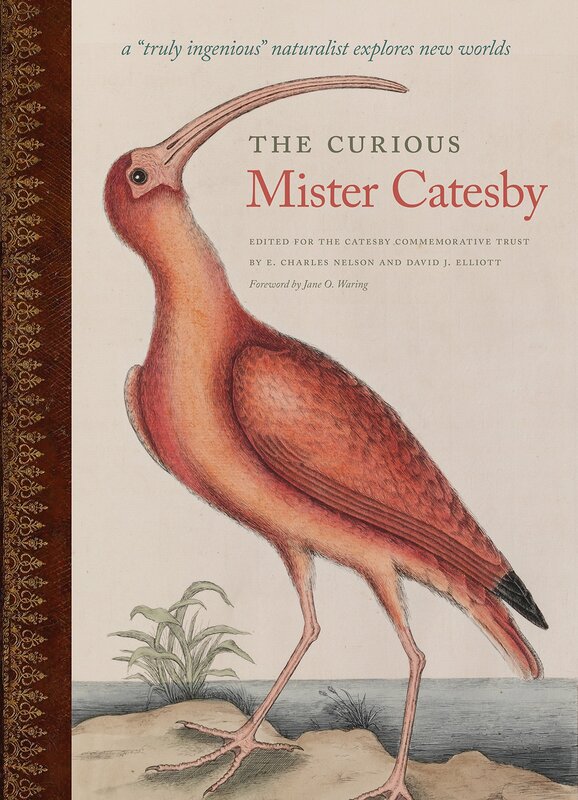 The book, The Curious Mister Catesby, is a treasure and I’m lucky today to have E. Charles Nelson do a guest post telling us more about this intriguing man. E. Charles Nelson: The natural history of Carolina, Florida and the Bahama islands is undeniably a rare book, and a very remarkable one, too. Its author and illustrator, Mark Catesby produced the book himself beginning soon after he returned to England from South Carolina and the Bahamas sometime in 1726: “The whole was done within my house, and by my own hands …”. He learned how to etch on copper, and then etched the 220 copperplates, signing most of them with his distinctive “MC” monogram. After the plates had been printed by Godfrey Smith, Catesby hand-coloured them, or supervised the colouring. It is easy to see that to create the 170-odd copies of The natural history … that comprised the original printing required an immense personal investment of time and energy. Mark Catesby had the first copies of the first part, containing the first 20 plates and accompanying letterpress, ready in mid-May 1729. Several contemporary British newspapers reported that Catesby, introduced to Court by Lord Carteret (one of the Lords Proprietors of the Carolina Colony), personally presented a copy to Her Majesty Queen Caroline. That Catesby and his book about the natural history of North America merited this personal introduction to the Queen Regent was exceptional, as was the praise the book received: “… a Work superior to any Thing of the Kind” being one comment. Dr Cromwell Mortimer, the Secretary of the august Royal Society of London, went so far as to claim that Catesby’s Natural history … was “the most magnificent Work I know of, since the Art of Printing has been discover’d.” The superb copy which Mortimer owned, bound in full russia with his armorial design stamped in gold on the covers, is today in the Smithsonian Institution’s library. Carolina Parakeet and Bald Cypress. Digital realization of original etchings by Lucie Hey and Nigel Frith, DRPG England; courtesy of the Royal Society©. Mark Catesby continued to draw and design, etch and colour, and write for 18 more years until his book was completed in two volumes, each with 100 plates, and with an appendix of another 20 plates. It was no pocket-book: the pages of bound copies measure around 52cm × 35cm (more than 20ins tall, by 12ins across). Cashew. Digital realization of original etchings by Lucie Hey and Nigel Frith, DRPG England; courtesy of the Royal Society ©. Magnolia Digital realization of original etchings by Lucie Hey and Nigel Frith, DRPG England; courtesy of the Royal Society ©. England in 1719, he was already lauded as “a very ingenious gentleman” and had been labelled “that curious Botanist … of Virginia”. Plants raised from the seeds Catesby had sent to nurserymen were blooming in London gardens by 1715. Although somewhat elusive, Mark Catesby’s links after 1728 with several parishes situated on the eastern side of London indicate that that was where he set up home with his partner Elizabeth Rowland. Between April 1731 and December 1737 the couple had four children, but, unconventionally, they did not get married until October 1747. Mark died “at his House behind St Luke’s Church” on Old Street, London, on 23 December 1749. 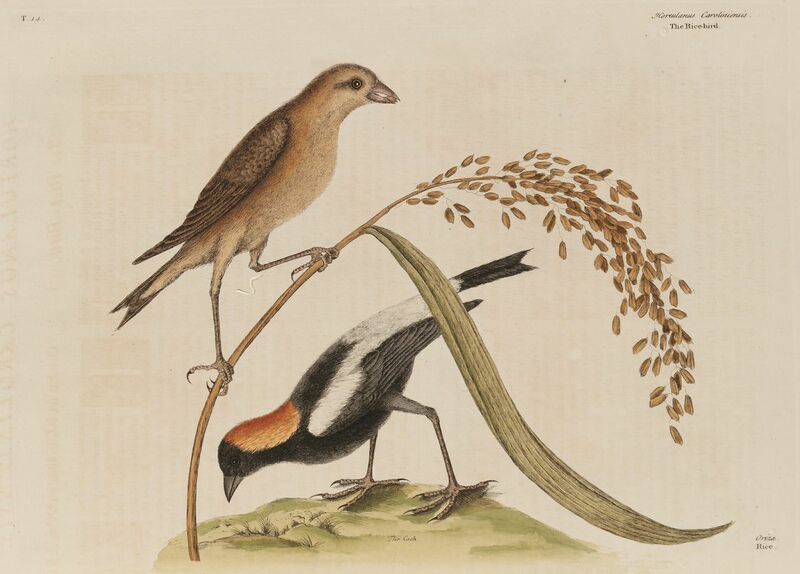 Bobolink and rice. Digital realization of original etchings by Lucie Hey and Nigel Frith, DRPG England; courtesy of the Royal Society ©. 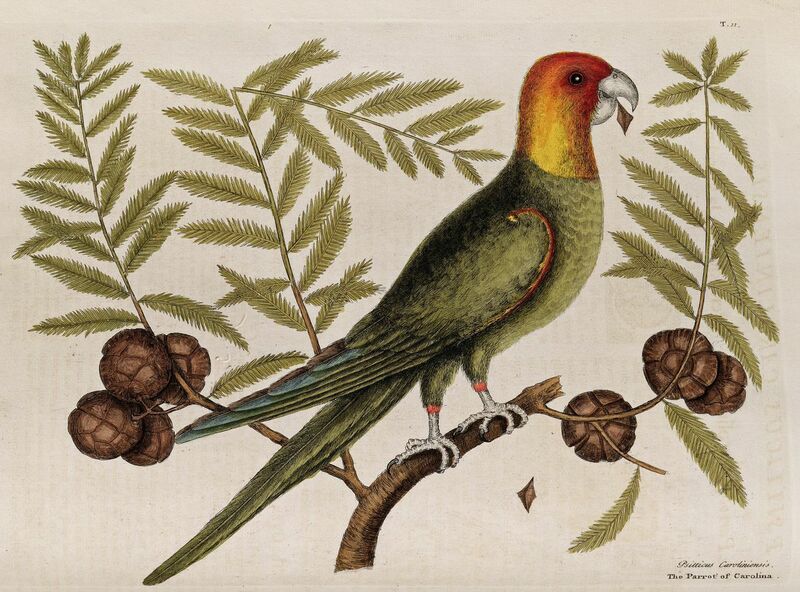 Mark Catesby’s sumptuous Natural history … was never intended as a “popular” book. The handiwork of one curious and ingenious man, it was grand in execution and ground-breaking in conception. Never heard of him. Very interesting. Me neither, Betty. So nice to find out something new! What stunning bookplates! Those drawings are so exquisitely detailed it’s no wonder so many studied his work to learn nature’s secrets. The book is really beautiful, too. This is really interesting! I’ve read about Catesby and seen many of his drawings but this new book takes the information to a new level. Lovely! So amazing what they could do before the age of telephones and cameras. We think we’re so advanced, but we stand on the shoulders of real giants. This looks like an interesting addition to our knowledge of one of the early naturalists and explorers who first described the American flora and fauna. 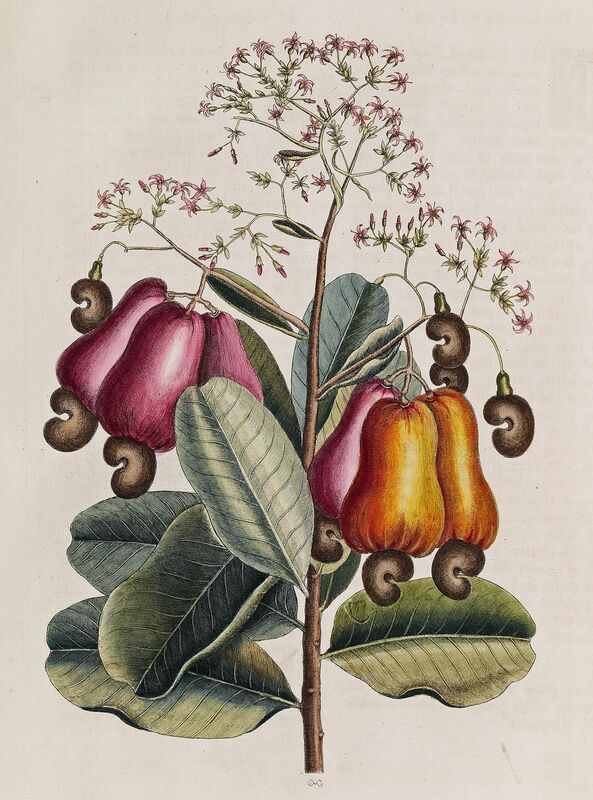 Catesby’s artwork is a wonder for his time.